Elite by Maxi-Matic's powerful dual burner, self-cleaning cast iron hot plate is perfect for cooking at school, office, or home. The 1500 combined-watt will heat up quickly and the cast iron heating elements will ensure even cooking. 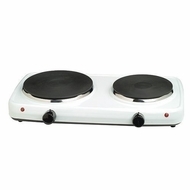 Features include cast-iron flat heating plates, power indicator light and dual adjustable temperature control.